We are experiencing the highest concentration of carbon dioxide (CO2) in our environment ever seen by humankind. There’s a lot of talk going on right now about the amount of CO2 in the atmosphere and exactly what that means. Although spikes such as this have happened somewhat frequently in Earth’s history, many scientists are concerned about the most recent rise as it has happened extremely fast and has begun to impact plants and animals in ways we did not expect. This is not an article discussing the causes of rising CO2 in the atmosphere. Instead, let’s look at the impact that it is already having on our environment and economy in order to better understand the problem we are dealing with. 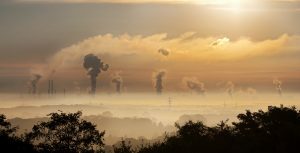 What exactly does carbon dioxide do? Carbon dioxide is an important element of our atmosphere. It helps regulate the temperature of the planet and it serves as an integral part of photosynthesis, the process by which plants produce energy. The amount of carbon dioxide in our atmosphere has generally fluctuated throughout history, rising and falling due to changes in climate and the types of organisms alive at the time. Current levels are much higher than what have been found in samples of ancient ice dating back up to 800,000 years. One would think that with higher concentrations of CO2 in the environment, plants might be able to grow to gargantuan heights at record speed due to CO2 being more readily available to use for photosynthesis. In reality, this is indeed what is happening. Plants are growing at a faster rate than before, and they are able to produce more stored energy in forms such as sugar. While this sounds great on paper, it is having some potentially devastating side effects as well. Even though plants are growing faster than before, research is beginning to show that the food they produce is actually less nutritious than before as well. Because plants are able to produce much more stored energy, this excess is actually serving to crowd out other nutrients such as zinc, potassium, iron, and calcium from the plants. This can lead to crops that have less nutrients and protein in favor of more sugar. 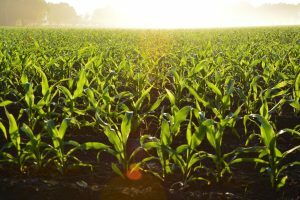 In addition to this, studies have shown that the additional increase in global temperature due to increased CO2 negatively impacts crop yields at the staggering rate of between 3.5 to 8.5 billion dollars for every additional ton of CO2 emitted. Pollen has been affected by the change in carbon dioxide as well- a recent study suggests that the protein content in pollen has dropped by a third since the 1800s. This is very impactful to pollinators, especially bees that have evolved to feed their young specific amounts of pollen. 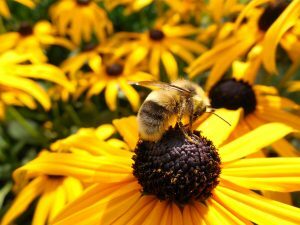 It is unclear how a protein-deficient diet will affect these species, however shorter life expectancies could be expected which could lead to pollination difficulties for flowering plants. The rise of CO2 concentrations has also started to change leaves as well. Normally plants use tiny openings, or stomata, in their leaves to ‘inhale’ CO2 and ‘exhale’ water. Plants are starting to develop leaves with fewer of these openings since carbon dioxide is easier to grab in the air, while as a consequence they might start releasing less water back into the atmosphere. There are other complex effects of increased atmospheric carbon dioxide sure to be discovered in the coming years. However, it can be easy to make a difference. By taking steps to slow the speed of this rapid increase, we can more efficiently learn its effects on the world around us. Find out more about your carbon footprint and what you can do to reduce it by visiting the EPA’s carbon footprint calculator at: https://www3.epa.gov/carbon-footprint-calculator/. Thank you so very much for your kind words, and for sharing and following our page! Thanks! We are so glad you liked it – more to come! Thanks so much! Hope to see you back again soon! Thanks so much! More blogs and info soon to come! Thank you so much following along and for sharing our page! Please check out our other published articles, we have a new one coming soon! Thanks so much for the lovely comment! We are so happy to have you following along. Thank you so much! We appreciate your kind words. Thank you so much for reading Spriggly’s Notes on Nature blog. You left a comment referencing spelling errors within posts. While we apologize that mistakes can get made, we could not find the spelling errors you noted across our blog posts, beyond one or two words that somehow were missing a space between due to a formatting issue. If you would not mind, please let us know which post(s) you found errors upon and we will ensure their review. The accuracy of our facts, along with our spelling and grammar, is quite important to us. If you happen to be reading the page through a translator, please note that we are not in control of the translations being provided, which are generally not 100% accurate. We wish you a wonderful day and thank you again for your interest in Spriggly’s! I think the admin of this web site is genuinely working hard for his site, since here every material is quality based stuff. Thank you so much for your kind comment and interest in Spriggly’s! Thank you so much for your kind comment! We very much appreciate your interest and support. Our work means everything to us and we hope one day we can do it full time! Please share our pages far and wide and follow us on social media! I’ll immediately grab your rss as I can’t to find your e-mail subscription hyperlink or newsletter service. Do you have any? Kindly let me recognize so that I may just subscribe. Thanks. Hi there! Thanks so much for your comment! We currently do not have a newsletter, although we just we’re talking about starting one! Your message has definitely sparked the fire for us to get that going. Stay tuned! We hope to have a newsletter coming out quarterly quite soon. A new blog is also on its way this week as well – your RSS feed should be featuring us soon! Hey there! Please connect with us at info@sprigglys.com and we can connect further. Hey Gertie! Thank you so much for reaching out. Can you please let us know exactly what is the issue? We have not experienced a problem before and definitely want to fix any that there is. I desire to recommend you few interesting things or tips. We will definitely consider a part two to this article! We love to hear that! Thanks so much and come back again soon! you will be a great author. I will always bookmark your blog and will come back at some point. Thank you so very much and thank you for following along! Amazing things here. I’m very glad to look your post. Thanks so much and I am looking forward to contact you. Hey Leanne! To connect with us further at any point, please reach to info@sprigglys.com. Hey Shanna! Thanks so much for your comments. Please reach out to us at info@sprigglys.com so we can connect further. Hope to hear from you soon! I have very little understanding of coding however I was hoping to start my own blog in the near future. Hey Hai! Reach out to us at info@sprigglys.com and we are quite happy to help! Thank you so much and thanks for passing it along!! Thank you so very much! We hope you’ll continue to follow along with Spriggly’s. Great, look forward to seeing you back soon. Haha, thank you very much for your kind words. Let us know if you take the plunge and start your own, we would love to read it! Thanks for the kind words! Keep checking in for new content.